“The Kid Who Would Be King” is an earnest but fun reimagining of the King Arthur legend in modern England, but with a twist. This time the kids are running the castle. Most tellings of the Arthurian legends speak of a time when King Arthur and the valiant Knights of the Round Table will rise to safeguard England once again during its direst need. Miss Bala (PG-13) 1 hr. 45 min. The Gandhi Murder (NR) 2 hr. 11 min. They Shall Not Grow Old (R) 2 hr. The Least of These: The Graham Staines Story (PG-13) 1 hr. 49 min. 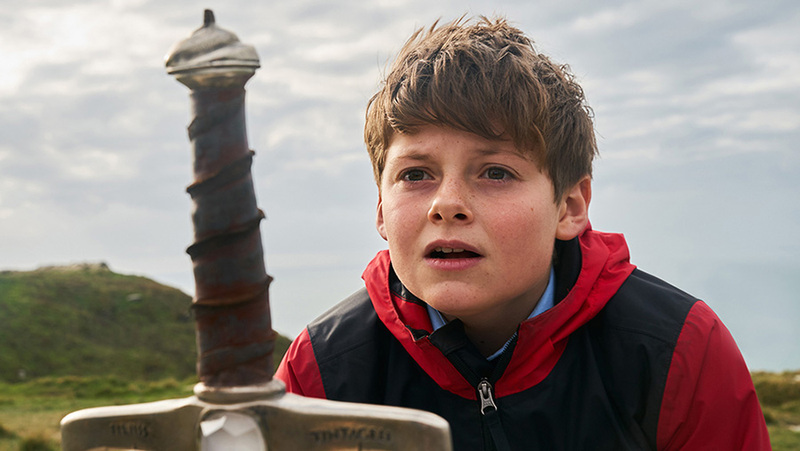 Writer-Director Joe Cornish’s latest film tells this tale, only the reincarnated Arthur, named Alex (Louis Ashbourne Serkis) and his knights are all middle-school-aged kids when the magical sword Excalibur is yanked from the stone. Alex is a kind and courageous every-boy, who looks after his best friend Bedders (Dean Chaumoo) and attempts to see the good in bullies Lance (Tom Taylor) and Kay (Rhianna Doris) when he needs some muscle for the impending battle. With Excalibur in the proper hands, the evil witch Morgan le Fey (Rebecca Ferguson) — Arthur’s twisted half sister — and her demonic knights are awakened from their slumber beneath the land and begin their quest to retrieve Excalibur, whose bearer is considered the rightful ruler of England. Merlin is a teen now because he lives backwards through time, but he also appears in his elder state at times with Patrick Stewart taking over the role. Incidentally one of Stewart’s earliest film roles was as a knight in John Boorman’s 1981 classic Arthurian retelling “Excalibur,” which is decidedly not a kids movie, but one well worth watching at the proper age. While not quite as entertaining as the 1980s films like “The Goonies” or “Monster Squad,” which clearly inspired Cornish, “The Kid Who Would Be King” is a good time at the movies and a solid introduction of King Arthur lore to kids. It’s message of unity, friendship, and courage standing in opposition to hate, ignorance, and evil is a noble one for any age. The film isn’t faring very well at the box office, which is a shame. Hopefully, families will discover it when it hits a streaming service or other formats, and the legend of King Arthur will arise anew in the hearts of mankind. If your TV screen just isn’t large enough to watch the Super Bowl this Sunday, then the Skylight Cinema in Bentonville has a treat for you. The Skylight Cinema will show the Super Bowl battle between the NFC’s Los Angeles Rams vs. the AFC’s New England Patriots in high definition on a double-wide movie theater screen, with theater-quality surround sound. Admission is free, and seats will be available on game day on a first-come, first-served basis. Kickoff is set for 5:30 p.m., but Skylight Cinema recommends arriving early to grab your seats before the game begins. Then, you can enjoy the game in their luxury recliner seating, and order food and beverage from the theaters’ menu. Turner Classic Movies annual celebration of Academy Award-winning and nominated movies kicked off Friday morning and runs through March 3. Every movie playing on the channel during that span either won an Oscar or was nominated for one in at least one category. Throughout the day, films are packaged in various themes, such as “Prison Movies” on Feb. 7, “Silent Films on Feb. 13, or “Exotic Locales” on Feb. 21. However, in its two nighttime blocks, TCM will pit two pairs of films against each other for viewers to compare and then pick for their personal favorites, like tonight “The Grittiest New York Films” with “The French Connection” (1971) at 11 p.m. and “Taxi Driver” (1976) at 1 a.m. or on Saturday “1960s Visual Special Effects Winner,” which pits “Fantastic Voyage” (1966) at 7 p.m. against “Doctor Dolittle” (1966) at 9 p.m.